« West Abbotsford Hartwell Townhomes in Westerleigh Community from $229,900! Grand Opening at the Hartwell Abbotsford Westerleigh Polygon Development ON NOW! Two 18 storey high-rise towers will make up the new master planned Richmond Centre community at the Mandarin Residences by Wall Financial and Fairborne Developers. Aptly named the new Mandarin Residences Richmond City Centre, the signage is up and the marketing has began for the most impressive new Richmond condo development in recent memory. Situated just across the street from Richmond Centre, the new Richmond Mandarin Residences condos for sale will be affordable with many homes under $400k and some from under $300k as well. The preconstruction Richmond Mandarin Residences are located within the downtown centre of this bustling and multi-cultural city, and will be situated just next to the beautiful Brighouse Station, the first stop on the Canada Line SkyTrain route. The project site for the new Richmond Centre Mandarin Residences condo towers will be at No. 3 Road and Saba Richmond BC. The VIP previews for the Mandarin Residences Richmond condos for sale is starting in March with presales starting some time in April with the public grand opening later that month as well. Imagine being just steps away from all the daily shops and services, hundreds of dining and shopping opportunities at Richmond Centre, Yaohan Centre, Osaka, Parker Place, and Aberdeen Mall. The No.3 Road thoroughfare where the new Mandarin Residences Richmond condos for sale are located has everything that you would possibly need. In addition, home owners may never need a car again as you will be just fifty steps away from the Canada Line where you can access Downtown Vancouver in less than twenty minutes as well as YVR from less than seven minutes along the SkyTrain line. The new Richmond Mandarin Residences condo towers is all about eco-friendly design, livability, affordability and sustainability. The first installation of the signage is now up with VIP Previews starting March 2012. You will need to confirm your interest in the VIP Previews by filling out the online form here. As well, the new Mandarin Residences Richmond condos for sale is built by a team of experts that includes Wall Financial (Wall Centre Richmond, Peirmont, Yaletown Park, Q, Capitol Residences and TIME) as well as award winning developer Fairborne to create the ultimate urban residence in the Richmond real estate market. Get on the VIP list today! Priority registration is now underway at the preconstruction Richmond BC condos at the Mandarin Residences that start from $299,900. There are over one hundred and fifty homes priced under $399,900 and the previews start March with the public grand opening starting in April 2012. 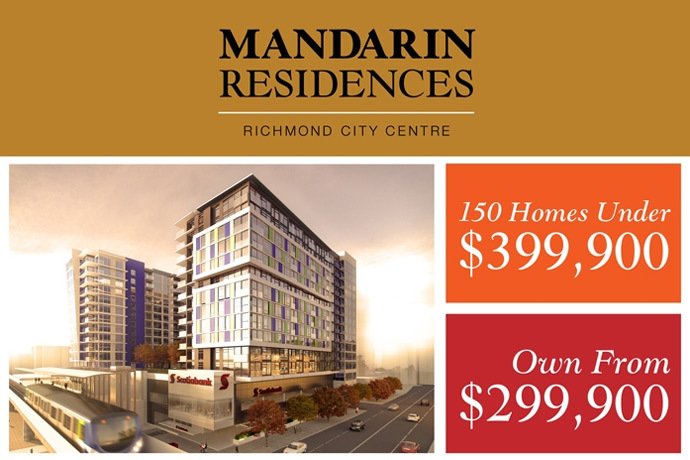 With real estate values in Richmond BC skyrocketing, the new Mandarin Residences will certainly garner a lot of attention, especially among the growing population moving from other municipalities into this beautiful city. The preconstruction Richmond Mandarin Residences will feature everything you want in a great location: conveniences to amenities and services, close proximity to major roads and public transit as well as a locale that is within beautiful green spaces and urban recreational amenities. The new Mandarin Residences in Richmond BC real estate market certainly delivers on all fronts with a location at No 3 Road and Saba Street. The preconstruction Richmond Mandarin Residences will consist of the construction of 2 towers that will offer close to 350 new homes to the central locale just next to the Richmond Centre Shopping Mall as well as to the Brighouse SkyTrain Station along the Canada Line. In addition, golf courses, community centres and top rated schools are nearby. The preconstruction Richmond Mandarin Residences for sale will also feature dramatic and modern West Coast architecture with coloured glass panels, amazingly large outdoor entertainment sized patios as well as a grand entrance. Inside, you will find exclusive and designer interiors with marble counters in the ensuites, Fisher & Paykel kitchen appliance set and open concept bright layouts. The new Richmond Centre condos at the Mandarin Residences by Fairborne Developers is coming soon! Be the first in line to experience what true Richmond urban condo living is all about. Be the first on the Canada Line Skytrain at Brighouse Station or experience over one million square feet of prime shopping, restaurants and entertainment at Richmond Centre. It all begins right here at the new Richmond Mandarin Residences by Fairborne Homes. The Mandarin Residences Richmond Centre condos will feature homes from under $299,900 and also 150 residences from under $399,900. There are a total of 347 suites for sale and the show room is coming Spring 2012! The previews are expected to launch this March 2012 with 348 opportunities for homebuyers to purchase a new Richmond Mandarin Residences by Fairborne. With its awesome location within Richmond Centre downtown district, the new Mandarin Richmond condos for sale will be next to the Brighouse SkyTrain Station, making the Lower Mainland within easy and quick reach via transit. Also, the new Richmond Mandarin Residences are across the street from hundreds of shops, boutiques and dining at Richmond Centre Mall and only steps away from Parker Place, Yohan Centre and the new Aberdeen Mall. The project is brought to you through the collaboration of Wall Financial and Fairborne Homes and pricing is going to start under the three hundred thousand dollar range. The Mandarin Residences in Richmond are located at No. 3 Road and Saba whilst the presentation centre will be opening at 8171 Ackroyd Road Richmond. 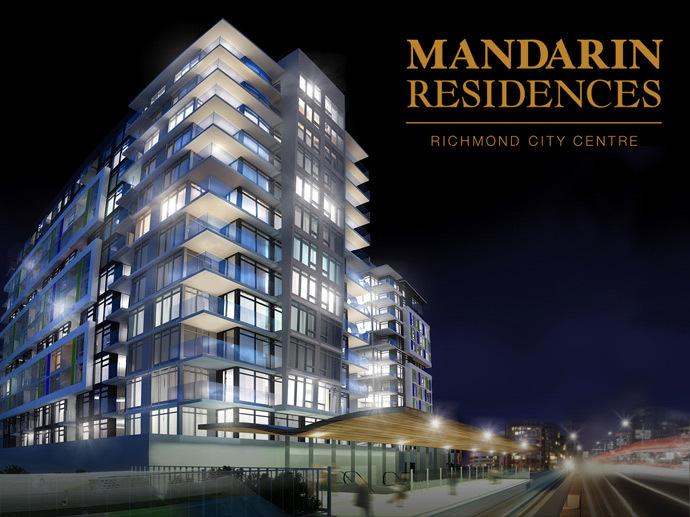 OWN from $299,900 with 150 Mandarin Residences Richmond City Centre condos priced from under $399,900! Thank you again for your interest in the Mandarin Residences in Richmond City Centre real estate district. As a VIP pre-registrant, you are invited to learn more about the new Richmond condos for sale at the Early Preview of the brand new presentation centre at the preconstruction Richmond Mandarin Residences. Brought to you by Fairborne and Wall Financial, the preconstruction Richmond Mandarin Residences condos offer 348 condominium and townhouse residences in 2 sixteen storey concrete towers located in the heart of Richmond’s City Centre real estate district. Featuring Richmond BC’s finest location at Brighouse Station on the Canada Line SkyTrain, the new Richmond Mandarin Residences will redefine convenient urban living. Steps to hundreds of great resturants and over a million square footage of prime shopping and boutique retailers, you may never need your car again whilst living here at the preconstruction Richmond Mandarin Residences for sale. The Mandarin Residences Richmond City Centre presentation centre features a grand building model and two stunningly designed display homes. You will certainly be impressed with the preconstruction Richmond Mandarin Residence’s quality, incredible location and fantastic Richmond real estate value. The presentation office will start previewing on March 17th at 10am at 8171 Ackroyd Road Richmond at No. 3 Road right next to the Chapters. The regular open house for the preconstruction Richmond Mandarin Residences condos will be between 11am and 6pm but closed Fridays. Doors will open on Saturday, March 17th and Sunday March 18th at 10am and stay open until 6pm during those 2 advanced preview days. For more information regarding the preconstruction Richmond Mandarin Residences, please make sure you register online for all the details. Thank you for your interest in Mandarin Residences at Richmond Centre, the newest community located adjacent to the new Brighouse Station on the Canada Line in the popular Richmond BC real estate market place. The preconstruction Richmond Mandarin Residences will be steps away from Richmond Centre, Aberdeen Centre, and Parker Place. That’s over a million square feet of shopping plus hundreds of restaurants – it’s the best of Richmond BC real estate districts, right outside your front door. The preconstruction Richmond Mandarin Residences’ two 18-floor condominium residence towers provide lasting value for generations to come, with three hundred and forty eight 1 and 2 bedroom homes offering savvy floor plans and expansive windows for ultimate flair and livability. The Fairborne Homes and Wall Financial developers and sales team are working hard to bring you this unique offering in Richmond BC real estate market place as quickly as possible and are aiming for VIP sales at Mandarin Residences in Richmond Centre in April 2012 with EARLY PREVIEWS IN EARLY MARCH. In the meantime, your name has been added to our preconstruction Richmond Mandarin Residences Condo VIP list and we will keep you updated on new details for this exciting new community. Warmest Regards, The Mandarin Residences at Richmond Centre Sales Team. The Mandarin Richmond Condo Presentation Centre – COMING SOON at 140-8171 Ackroyd Road – next to Chapters. *Pricing and availability at Mandarin Residences in Richmond Centre real estate market are subject to change without further notice. The preconstruction Richmond Mandarin Residences condo developer retains the right to change any information contained herein. This is not an offering for sale. Any such offering can only be made with a disclosure statement. E&O.E.